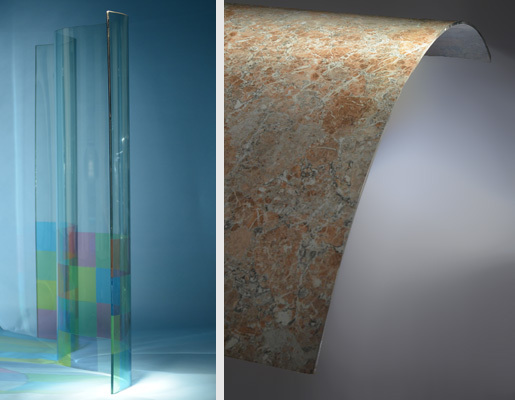 The tempering and heat strengthening processes change glass characteristics from fragile and easy to break to a stronger and safer material in different levels. Heat strengthened glass is two times stronger than annealed glass used to overcome thermal breakage risks under normal conditions and moderate wind loading as well as eliminate the wavy effect of glass. Toughened glass is heated up to 700 degree Celsius and rapidly cooled; is five times stronger than annealed glass with the highest resistance to the thermal and mechanical stress; its heat endurance increases to stand up to 300 Degree Celsius; it is a safety glazing as it shatters into small pieces at breakage. With our 14 tempering furnaces with both horizontal and vertical process capability and the most up-to-date technology in glass bending, we temper flat and curved glass with minimum optical distortions in dimensions up to 2.40 meters x 5 meters with glass thickness from 4 mm to 20 mm and up to 2.4 meters x 4.2 meters with a minimum radius of 1.5 m respectively. Depending on the glass type, thickness, and radius required, curved glass could be annealed, laminated, heat strengthened or tempered. Please contact us for list of available mould shapes. Flat & curved tempered glass is used in different applications such as glass for vehicles, house appliances, lighting, architectural applications, shower cabins, shop fronts, doors and partitions, balustrades, decorative, and furniture glass. We guarantee our tempered and heat strengthened glass quality through our unique advantage of heat soak testing. Both heat strengthened and tempered glass cannot be re-processed after heat treatment, any alterations can cause premature failure.